Simplify. That’s my new years resolution (more on that later). So what better way to start the new year than with a dish which is simple in its ingredients, simpler in its preparation and anything but that in the amount of comfort food flavor and nutrients that it delivers…Methi Daal (Lentil Soup with Methi, or Fenugreek, Leaves). Methi, a common wintertime favorite, has a tangy, strong flavor that pairs well with creamy, nutty toor daal. This recipe makes for a quick, healthy side dish and leaves great leftovers for lunch. I used a recipe from Mahanandi that’s available here and made just a few alterations of my own. I used 1 cup toor daal (Mahanandi calls for 4 fistfuls and this roughly translated into 1 cup) cooked for 10 minutes; only 3 green chilis (the 10 green chilis called for seemed a little daunting); 2 tablespoons of tamarind paste (a lot of Indian recipes describe the amount of required tamarind as “lime sized” – just keep in mind that Indian limes are MUCH smaller than the limes available in American grocery stores); 3 garlic cloves in the tadka to increase the nutty rich garlic flavor (I have a garlic problem which is a borderline addiction); 1 tspn. lal mirch after mixing in the tadka when I realized the daal needed more of a kick (I was clearly wrong on not going with all 10 green chilis! But better safe than sorry since chilis can vary in spice). The real beauty to this recipe is that you dump everything into the pressure cooker, let it cook, do the tempering on the side and just mixthem together after the cooker completes…meaning minimal baby-sitting required. Serve a generous, hot portion over basmati rice and enjoy with a side of yogurt. I also like to dip pieces of warm rotis/naan into the daal. Random fact: when I was reading up on methi for this post, I came across this post, which claims that methi is believed to cure baldness…in case anyone out there is interested. So on my resolution for simplifying, I don’t usually make New Years resolutions but after thinking about Heidi’s question, I wondered if my personal policy of “not making New Year’s resolutions” is cover for avoiding examining what needs change and perhaps is a way to avoid the creation of goals so as to avoid the possibility of failure. I decided yes and started thinking maybe in 2009, I should slow down and maintain perspective. For me, that means that in 2009, I want to simplify my life – I want to keep my work and the number of projects I take on in check [read: to not be busy all the time], to not get annoyed so easily (or at least to not be annoyed for very long) over small stuff [read: to just have fun and not waste time being annoyed over little things], to celebrate the friends who support and love us and dedicate time to laughing with them and asking how they are doing [read: now that I’m going to have free time, I will be better about calling my friends] and to refrain from making large purchases and reduce my need for shopping therapy (with the caveat that I can get a Kitchen Aid mixer with a pasta arm pending good behavior) [read: we’re “apparently” in a recession, so I’m going to act like it]. Also, you may have noticed Hungry Desi got a facelift for 2009! *My brother created a pretty banner picture at the top…purely vain facelift feature. *You can easily subscribe by RSS Feed* (at the top right) or by email (towards the top right of the sidebar) so Hungry Desi recipes are delivered to you directly. *Now you can print posts by clicking on “Print this Post” right above the picture. *I’ve added a Recipe Archive (top bar), which you can click on to see all recipes by month and more importanly, all recipes by category. *Speaking of recipes by category, I’ve changed the categories (also viewable at the right) so recipes are now filed By Course (appetizer, dinner, dessert, etc.) and By Ingredient (say you pick up some fresh baby eggplants and need an idea for what to do with it…just click on “eggplant”). *I’ll be building on the spice list in the Masala Rack (top bar) and added a comments feature. *I’ve removed the line above the photos which tells you what categories each post fits into – didn’t seem very useful. These changes have all been thanks to my new Thesis theme, my brother who’s helped me get much of this up and going and all of your suggestions. Hopefully these changes will make it easier for you to read and easier for me to post – ahhh lovely complication which will hopefully lead to simplification. And please let me know if you have any other suggestions! Best wishes for 2009! What’s your new years resolution? Happy New Year and best wishes for ’09! *For those of you have wondered what this RSS Feed rage is all about (like me), it’s actually, as I’ve discovered, really pretty handy. You can subscribe to my blog and any other publications by RSS Feed and it all gets delivered to one convenient location…in case you don’t want to troll fifteen blogs a day. Just send them all to your Google Reader and read them in one place. There’s probably a lot more to RSS than this but just thought I would share. good luck with your resolutions! heidi’s post made me do some thinking too.. although my resolutions thus far are mostly diet and exercise based 😉 here’s to 2009! Nith! 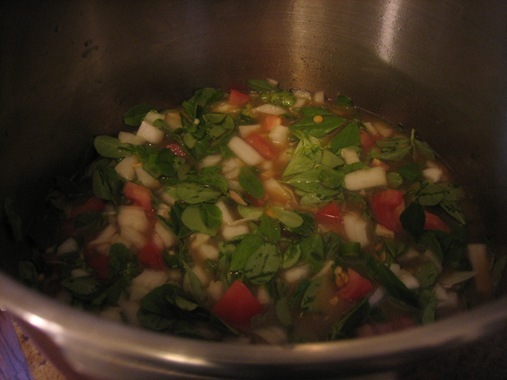 I made the same thing the other day and was thinking to tell you about methi pappu! 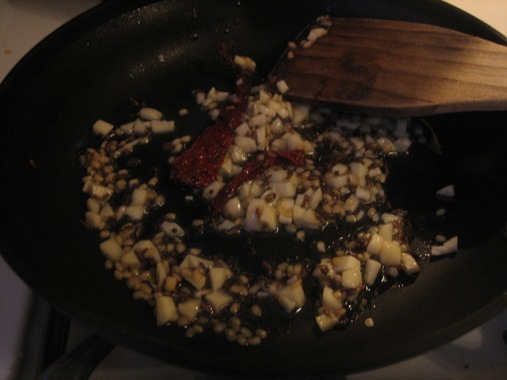 I did add lots of caram peppers and the girls loved it! Try making methi parathas/roti/poori! so yummy. why can’t you come and cook for us every day?? 🙂 site looks great…glad you went with the indian-ish script. very nice…. Daal looks very homely. How about methi’s bitter taste? Never occured that it could be used in Daal. Will try it. Foodie, let me know how it turns out…the bitter taste is tempered by the dhal taste. This might be a good way to introduce kids or just someone who doesn’t like methi to it’s taste. hi, my first time on your blog – nice space you got! 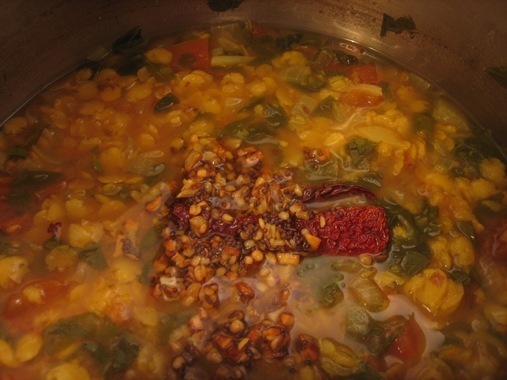 this daal is so good…I like it as a soup sometimes too…..Methi is a favorite of mine, I am just recognizing its health benefits….I hope it use it even more! ranjani – thanks! looking forward to checking out yours! trupti – who could ask for more than food that tastes good and is healthy too 🙂 i’m curious to hear more about your soup recipe! Wow, this looks yummy — and I love pressure cooker dishes. And thanks for translating the lime sizes for us. Who knew they were so much smaller in India. Great new year’s resolution — I’m going to adopt the same. Mike, thanks for stopping by – I’ve been enjoying reading your blog! 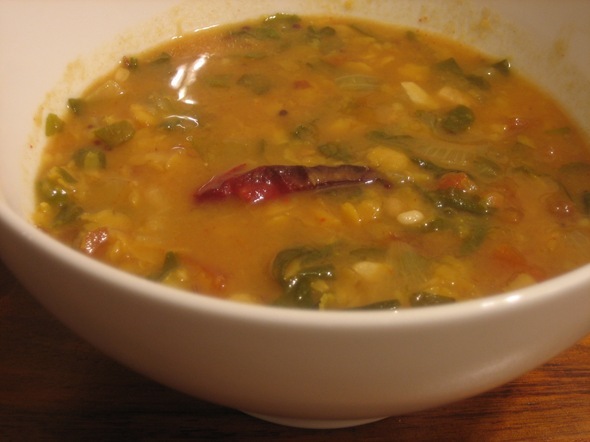 The richness of toor dhal is what makes it one of my favorites – a rich yet nutritious indulgence! Shinyung, agreed – pressure cooker dishes are great, especially when you’re making a few dishes at one time. The lime sizes always confused me…I couldn’t figure out how anyone could use THAT much tamarind 🙂 Good luck with the new year’s resolutions…hope you’re doing well. ND: Thanks Shayma. I’m glad you found Hungry Desi and appreciate the compliments. I’m still very new at this 🙂 Looking forward to checking out The Spice Spoon.